After blogging has enabled me to publish whatever I do including arts and paintings, I am being more motivated to work hard at them. Also internet technology has made it possible for me to learn new styles of painting. Therefore, in a way, information technology has revolutionized arts and has enabled artists to keep going on, at least for me! This is the painting of the Mount Everest from the north face. I found this subject in the cover page of my sketch pad! I completed this in three different sittings. On the first sitting, I made the head of the mountain and painted the sky (which I consider the easiest part in any painting but lately my concept is changing, thanks to this picture!). At this point, I was like dropping the art because it didn't turn out good. However, the next day, I thought to continue it even if it doesn't turn out good - just for a practice! So, I made the lower mountains and had to work very hard with them to get them absolutely dark. However, at the end, after making the darker part alright, the main part of the mountain started to look shiny and good without any modification! Wow! So, I learnt that I shouldn't judge my painting unless it is fully completed and I should keep going until I finish it off! It was a great lesson for the beginners like me! On the third sitting ,I tried to brighten the bright part by darkening more the shady regions (it was like editing in writing!). I made the sky also darker, in the meantime, and immediately hated what I had just done! I thought that I had once again ruined the painting by adding more colors to the sky. It looked a bit better after drying but for the most part I had overdone it and there was no way to reverse it. 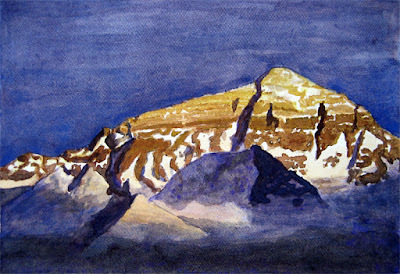 This is the watercolor painting of another famous mountain of Nepal, Mt. Ama Dablam which is quite near to Mt. Everest. 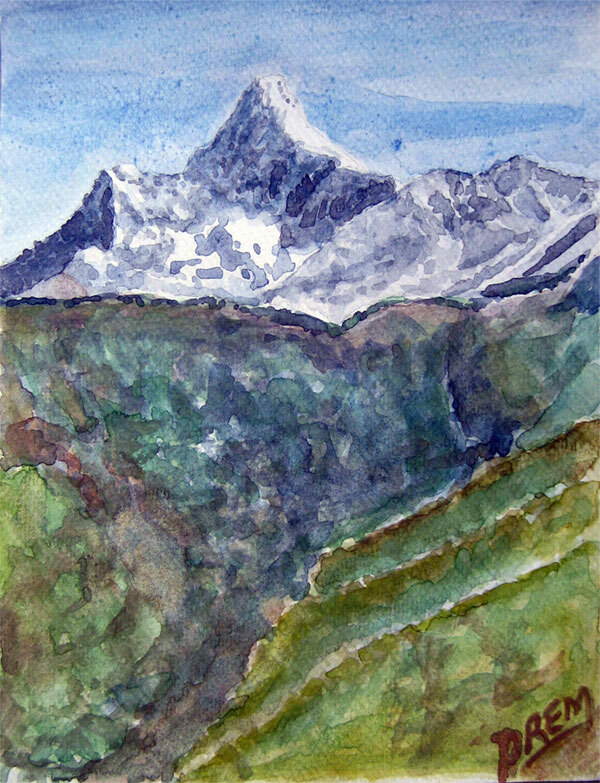 I painted this by referencing a postcard image. I have made the sky better as compared to previous picture. However, I messed up with the hills and mountains below the mountain. And this much comments from me on my own work. I wish to know your views too. So, do not forget to leave your comments below.